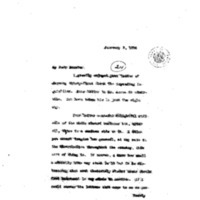 Woodrow Wilson thanks John Sharp Williams for his earlier letter. I greatly enjoyed your letter of January thirty-first about the impending inquisition. Your letter to Mr. Acree is admirable. You have taken him in just the right way. Your letter contains delightful ridicule of the whole absurd business but, after all, there is a serious side to it. I think you cannot imagine how general, at any rate in its distribution throughout the country, this sort of thing is. Of course, I know how small a minority take any stock in it but it is distressing that such absolutely absurd ideas should find lodgement in any minds in America. If I could answer the letters that come to me as perfectly as you answered Mr. Acree, perhaps it would be an intellectual and literary amusement. Hon. John Sharp Williams,United States Senate. Wilson, Woodrow, 1856-1924, “Woodrow Wilson to John Sharp Williams,” 1914 February 5, WWP18338, First Year Wilson Papers, Woodrow Wilson Presidential Library & Museum, Staunton, Virginia.